We offer GROUP DISCOUNT for groups of seven or more. or Call 757-877-7539 now to reserve your spot! Ice Rentals Do you have a large group? Would you be interested in renting the ice for a game of broomball or just have a great group skate? Call us at (757)877-7539 to schedule now! 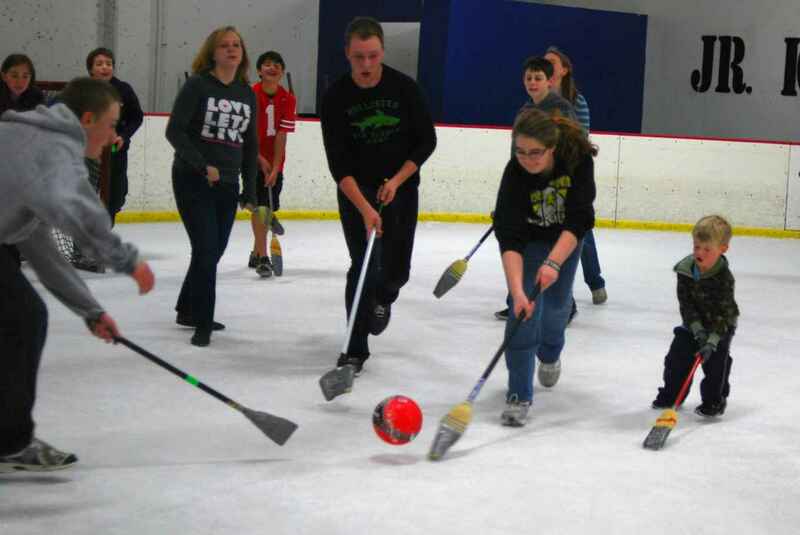 Broomball Basics Broomball is an on-ice game similar hockey, but with a few fun and unique twists. Like hockey, the object is to (hopefully) score more goals than the opposition. However, instead of the usual hockey equipment broomball players are dressed in street clothes and sneakers, armed with Broomsticks with the objective of hitting a 5-inch rubber ball into the goal rather than a puck. Bring your sneakers and leave the rest to us!! A Group Lesson can also be provided for a maximum of 12 students for $60.00. Admission and skate rental extra. Have Your Next Party or Group Outing at Hampton Roads IcePlex Ice Skating Parties for All Occasions! Hampton Roads IcePlex Specializes in Making Your Group Skating Experience Fun, Enjoyable and Affordable!